After five months of wrangling and recriminations, US President George W Bush has forced through the appointment of his UN ambassador while Congress is in recess. But the move may just be the start of the controversy over John Bolton, whose hard-nosed management style and past criticisms of the UN have angered critics. Mr Bolton's appointment comes just six weeks before UN heads of state and governments meet in New York to discuss wide-ranging and potentially divisive reforms of the world body. There are fears that just as the US is reaching out diplomatically in other ways, its hard-edged position at the UN will be entrenched. Domestically, it is certain to inflame the partisan ill-feeling between Republicans and Democrats, just as senators are considering Mr Bush's choice for the new Supreme Court justice. Mr Bolton - who once said that if the UN building lost 10 storeys, it would not make a bit of difference - was nominated to the post in March. But opponents held up his confirmation, accusing him of trying to manipulate intelligence and intimidate analysts who disagreed with him. Leading Democrats have hit out at the president's use of rarely-invoked constitutional powers to push through the appointment. 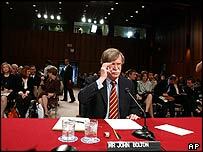 In July 2003, condemned North Korean leader Kim Jong-il for living like royalty while people lived in "hellish nightmare"
Senator Edward Kennedy said it was a "devious manoeuvre that evades the constitutional requirement of Senate consent and only further darkens the cloud over Mr Bolton's credibility at the UN". Earlier, Christopher Dodd, a senior Democrat on the Senate Foreign Relations Committee, described Mr Bolton as "damaged goods". One leading expert on US politics told the BBC the appointment would be unlikely to lead to a deterioration in political relations, "because it is hard to see how things could be any worse than they are now". But Thomas Mann, a senior fellow in Governance Studies at the Brookings Institution, told the BBC: "The irony is that as Condoleezza Rice works to try to put some life into American diplomacy you have a move like this that sends an entirely different signal. "It reinforces the president's standing among hardliners in his party and means that whatever accommodation Condoleezza Rice is making to the world, the US will still have a very hard-edged position at the United Nations. "It is a way of getting one of their real tough guys front and centre." The September summit represents a key moment for the UN which has been reeling from the rows over the US-led invasion of Iraq and from corruption scandals over the Iraqi oil-for-food programme. Reform has the dual challenge of re-establishing confidence in the institution, and of re-engaging the United States - the UN's largest member and the greatest contributor to its coffers. Some - including the president - say Mr Bolton is exactly what the UN needs if it is serious about reform. The president said "partisan delaying tactics" had left the US without a permanent UN representative for too long. As he appeared with Mr Bush to accept his appointment, Mr Bolton pledged to work to make the body a "stronger, more effective organisation", and one that is "agile enough to act in the 21st Century". He is certainly expected to be a very different ambassador to his predecessor. Former Senator John Danforth's ringing endorsements of the UN were not always shared by the Bush administration. In one of his last speeches in January he urged: "It's very important, I think the stronger you are, to be a country that listens and that takes onboard the views of others even though we may not end up agreeing with those views." Meanwhile, one of the most persistent critics of the UN, Senator Norm Coleman, who chairs a congressional inquiry into the oil-for-food programme, said last week that the controversy over Mr Bolton would soon become irrelevant. The bottom line, he said, was that Bolton had the confidence of the president, and would be in the post until January 2007 at the earliest. "He will speak for the president of the United States. He will speak for America."